We are continuing to investigate new synergies of architecture and ecology through the critical intersection of computational design and fabrication. Our focus is on exploring experiential and social potentials of new material and spatial configurations for architectural and ecological urban systems situated in the dynamic contexts of emerging biomes. The programme is designed to stimulate critical thinking through experience of research driven design projects that are developed in an intellectually rigorous and creative studio environment. Our projects are pursued by multiple iterations through hypothesis, material and computational experimentation, robotic fabrication, and evaluation; reflected upon in verbal presentations and group discussions, and documented in analytical and scientifically structured papers. Our Masters (M.Arch./M.Sc.) programme has two distinct phases – the Studio and the Dissertation. Both Studio and the Dissertation are aligned with, and supported by the research of the programme team and the advanced expertise our alumni and research colleagues in practice and industry. The Studio workshops, seminars and design projects are led by Emtech staff and our associated researchers, and offer a creative and intellectually rigorous sequence of that builds knowledge and skill. It provides an intensive engagement in Design Science and introduces our students to the wider community of design researchers in London practices. It concludes with guiding students through the formation of a detailed proposal for an original architectural inquiry that is to be pursued in the Dissertation. The Dissertation Research Studio extends the acquisition of research competencies through extensive collaborative dialogue with Emtech’s research community of active Post Doc researchers and PhD candidates. There are two main fields of Design Research that we are active in:- Dynamic Material Systems with Advanced Fabrication including robotic techniques, and Ecological Urban Design in emergent biomes. Students integrate explorations of the theoretical discourses, relevant sciences and case studies of ‘state of the art’ projects in the domain of their chosen topic, and set out the methods and protocols for the development of their Design Proposal. 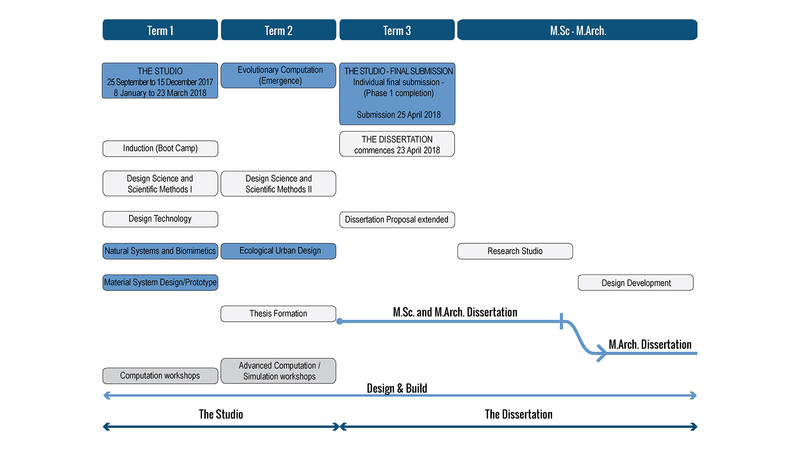 The development and conclusion of the final proposal is pursued through the iterative design cycles that students have acquired knowledge and skills in during the early phases of the programme. Design and Build is our ‘extracurricular’ collaborative student project, and is an essential part of the pedagogy and culture of EmTech. It runs right through the year, alongside both Studio and the Dissertation, and provides opportunities to design and deliver a built project with real material, structural, fabrication and assembly constraints. The experience gained enhances the design, computational and analytical skills students have acquired in Studio, and it develops crucial transferrable skills that are applicable to professional practice. Our Design Build projects have been published internationally in the architectural press since 2001,and have received industry awards.